Is Chelsea's shock win sport's greatest upset? Chelsea's staggering Champions League victory over Barcelona proves that sport at the highest level can still shock us, defy all the odds and leave us open-mouthed and scratching our heads. It proves that, despite the specter of corruption and match-fixing, the playing field is still a level one. That even if sponsors and governing bodies want the most entertaining or marketable sides to prevail, star teams don't win by right. Like anyone else, they must earn victory. With Chelsea down to 10 men, their captain sent off, losing 2-0 and Barcelona's fearsome Camp Nou jubilant - be honest, what were you thinking? How long until Messi scores? Will it be a record win for the European champions, who were seeking a fourth title in six years? Who will Barca face in the final? Whatever was going through your head, please don't try to convince me - even diehard Chelsea fans - that you thought the English team would go through. And even if you did, you weren't predicting that Lionel Messi - who has netted 63 times this season - would miss a penalty kick for the Spanish side and that goal-shy Fernando Torres would score for Chelsea, putting the outcome beyond doubt in the dying minutes. Dropped by Spain and with just three Premier League goals to his name this season, Torres confidently skipped past Barcelona keeper Victor Valdes with almost miraculous confidence considering how unassured he has been since an $80 million transfer from Liverpool in January 2011 and how uncertain he looked on the pitch after his late introduction on Tuesday. This was only a semifinal but Chelsea's win will go down as one of the greatest upsets in sporting history. I would put it alongside Buster Douglas flooring Mike Tyson to claim the world heavyweight title in 1990, Goran Ivanisevic winning the 2001 Wimbledon tennis title or the United States' "Miracle on Ice" Olympic hockey gold in 1980 as a straightforward gob-smacker. Chelsea may have been Champions League runners-up as recently as 2008 but the central players - Petr Cech, John Terry, Ashley Cole, Frank Lampard and Didier Drogba - were supposed to be past their peak. Chelsea only have a temporary coach after Roberto Di Matteo was asked to pick up the pieces when Andre Villas-Boas was sacked less than a season into his mission of rebuilding the squad. The Blues are still down in sixth place in the Premier League, and face the prospect of missing out on Europe's top club competition next season unless they win the May 19 final in Munich. Some will claim Liverpool's comeback in the 2005 final against AC Milan was more remarkable, but it wasn't against a side lauded globally as the best football team in history - although those boasts are sure to fade to a whisper now. Barcelona remain technically breathtaking, but it turns out the better side doesn't triumph automatically. Sport isn't about entertaining. It's still about winning - no matter how you do it. Greatest upset???!!! You have to be joking, Chelsea are a great team and this win was always on the cards. This article is a joke. I think you are forgetting that Chelsea had NO central defenders on the pitch at the time with Terry sent off and Cahill substituted. Also they were 2-0 down on the night and managed not only to prevent Barcelona from scoring BUT managed to slip in two goals of their own with just 18% possession. If coming from 2-0 down with only 10 players and not allowing the great MESSI to score is not an upset then what is?? Of course. Greatest upset ever. Who ever understands a little about futebol saw yesterday one team playing, dominating the entire field and the other waiting waiting and waiting just like the first game. How can you be great if you don't play Barça head head pushing forward and trying to score. Please don't say oh that was their tactic, 11 players in the box waiting for Barça to make any mistake. It showed a superior team that Barcelona is my friends. We love the beautiful game and when a team comes to the field with the only intention to defend its ridiculos specially at that level of competition. NOW CAN YOU IMAGINE IF MESSI SCORES THAT PENALTY, AND NOW CHELSEA HAS TO PUSH FORWAD. OH OH OH FINAL SCORE 5 X 1. Chelsea did a good job. just 18% possession and one man sent off yet the team has managed to go through. If Barca should have won they will think football is for them. The last two defeats for Barca by Real and Chelsea gave others spirit and sent message to Barca that they can lose like any other team. The dynamics of modern football has got to do with getting to score goals and defending so that you don't give your opponent any opportunity to overwhelm your defense with goals. Chelsea just did that and they deserve the win. Those who condemn Chelsea for having not played a rather open game, should request FIFA to change the rules of engagement whereby passes or ball possession for that matter count in winning!! Barca were at their usual best at Camp Nou – got a penalty, got Chelsea down to 10 men. All usual stuff with Barcelona at Camp Nou. Perhaps their plans for Chelsea did not reckon with die hard spirit of that team. Rory i agree with you completely,you statistics says it all,it's a great upset. It wasn't a suprise,Chelsea will always beat Barca any where, read history,Barca might be considered as the best,but not when they meet with Chelsea.It is never an upset but real football,so Barca should learn a lesson from this. it's an upset, because chelsea are not even in the top 4 in england, and they've had a turbulent season, and barsa have won an amazing 3 european cups out of the last 5.
this is no bigger than what happened this time 2 years ago at the same ground, in the same round of the competition. inter milan on that occasion came to the nou camp, and won in a similar way with 10 men. motta was sent off that night for inter, under mourinho. history has repeated itself. I hope its a destiny! especially at this stage in the league. Destiny cant be denied when her time has reached. Imagine the ball possession and the utilization techniques used by chelsea. I give them a plus, but they dont have to be relaxed at this level. Another warlord lies ahead of them. let them sit down and re-strategize, since some key-players are out on card-bookings. If every game happened as expected woudn't we all be bored of soccer, or of any game for that matter? "upset" !! what's that suppose to mean ! This was no upset. I for one, a diehard Chelsea fan has always maintained that I'd prefer to meet Barca along the way then any other team. True, no-one would have predicted that Messi would miss a penalty but these things happen. Maybe UEFA believed they were doing Barca a favor by pitching them against a seemingly weak Chelsea side. They must have forgotten that Barca had never beaten Chelsea either. Only problem was that Barca as good as they are do not have a plan B, simply because they think their system of playing is near almost unbeatable. Now reality has settled in, maybe other teams in La Liga will use the same approach, then we'll see how they adjust. l think the blues merited for their winnig, football is not about entertainment,but is all about winning ,bravo up blues. Theres no doubt Barca is one of the best teams in the world. But everyone seems to forget, this is the semi-finals in CL, WITH the best teams in the world. The difference between the top 8 teams in Europe are not that big. One has a good day, other has a bad day, and then this happens. Strategy definately also comes into play. Spanish football versus English football is also quite different. This has happened so many times in history, and calling it an upset this far in the tournament, is a bit much. No team can win everything, all the time, every season. Just look at other sports, the same things happens there. Barca is still Barca, and will come back just as strong next year. Maybe its their turn then, maybe its not. They'll still be one of the best teams. Chelsea got the typical play-off treatment that too many others have experienced against Barcelona: having a very key player sent off. it was not so much as chelsea winning it as barcelona losing it! It is sheer luck!!! if they play for the next 10 games in the same way as yesterday barca would win it hands down. At Camp Nou, down 2-0, no center backs, 10 men... Huge upset, yes. Sport's greatest? No. Chelsea are one of the biggest clubs in the world. It is the semi-finals of the Champion's League. All 4 teams remaining are some of the best in the world. Upset yes, Greatest no. This was a stunning performance by Chelsea that showed amazing resilience, but I'm not sure I'd call it an upset and certainly not among the "greatest upsets in sporting history". Ahead of the 2nd leg Chelsea had a 4-3 winning record against Barca in CL matches with 4 draws, and the massively expensive Chelsea squad has been at or around the top of the most competitive, some say best league in world football for several years. So while the Blues are not as good as they were Barca weren't facing Swindon Town! No doubt it was a dramatic game and Barca were expected to come out on top, but the author's incredulity at the result sounds ill informed and rather insulting to the Blues who obviously came in with a detailed game plan that worked! Barca lost because Chelsea had more heart, more luck, and because the Blaugrana were deluded into believing that tiki-taka will always win out when in fact you can't pass the ball through a space that isn't there. Messi and his mates were out-maneuvered and Guardiola was tactically bereft of an alternative idea. No matter, it's healthier for the game to have another team at the top table for once, not least of all because it reminds us that football thrives on diversity not just on one style of play. So well done Chelsea, you found a way to slay the beast and best of luck in the final. How is it supposed to be a greatest upset? If a team in semifinals wins another team then of course they got to be best of all. n its the first time i am hearing someone say greatest upset to an outcome of semifinal match......barca may look number 1 but dun forget that Chelsea is also biggest club in world....grow up dude! Upset? This is Chelsea, we're talking about right, with their team of internationals? Chelsea spent probably more than double than Barca has on their players in the last 5 years or so. It's their own fault that even after spending all that money they are still so far behind Barca that it's considered a "greatest upset". When two teams come so far at this stage in the uefa champions league, the past statistics have no meaning at all. Its all about who wants it more. Barcelona had their chances and did not know how to score, at home, against 10 players, and against chelsea missing the two central defenders almost the whole game. The barca defense? A total disaster!! In 180 minutes chelsea shot four shots on target and scored 3. How fun the game was? Superb. I really enjoyed chelsea defending and barca attacking. The game is not just about attacking. Its about defending as well, and chelsea displayed great will to defend and wait for their chance to score. Barca was not able to score one more goal. So is Chelsea's shock win sport's greatest upset? I dont see where the shock is. Chelsea was lucky to win – didn't play an attractive game – mostly defending – in the first and last game against Barcelona. If they've played good, they would not have Barcelona have so many chances to score. Barcelone did not score, because they were unlucky. Not every time the team that deserves to win actually wins. Barcelona deserved to win both games against Chelsea. when there is a Brazilian playing something magic can always happen!! Indeed, it's one of the greatest upsets in the history of Sports..
it was a great night. yeah, a night indeed. a night where chelsea showed d world dat futbol isnt about being the best team or having greater possession or wateva crap or may b d uaual barca camp nou magic. MESSI missed a PENALTY!!!!! Much was xpected from MESSI but he cldnt deliva. u may wonda y & i'll say he flopped cos xavi and iniesta cldnt bring it like they do. Tanx to Roberto he made a wise sub, a wise one indeed. tanx to torres he made it a day 4 chelsea & a nyt 4 barca. tanx 2 all chelsea fans hu wr at camp nou and those who watched live via satellite. Chelsea made them knw dat tho' "tagged best team" can still be beaten. IMAGINE 18% possession, 10 man, still put barca down. its futbol nt impossible. The majic was Chelseas' White Jersey. It was similar White Jersey that Real Madrid wore to win Barca within a week. After the match, fans drank more than 10 cartons of beer from my wife's shop till 3.00 a.m. Wonders shall never end. World should respect the art of defense. And I can't understand why only scoring goals is taken as best thing in football. To respect defense, every member of football community should go to field and at least play once as a defender. And this way we can get player of the year or Ballon D'Or winner a defender. -LOVE and RESPECT DEFENSE ! Its was a tough match for two great teams, the expectations where high, chances were few for the bacelona team, because of the mighty defence strategy the chelsea team were able to make do of. The Chelsea surprised all with their die-hard spirit. Barcelona is ALL foreplay and no penetration! So come on . easy with big phrase like greatest .. ok because yesterday was the prove that there is no such thing as the unbeatable team / the super team / the greatest team of all time…. All this is nonsense because the team sprit make the team rise and make the club great . Anti-football is what haters cheer for. Chelsea in nowhere near the level of Barca. Luck was with them on both legs. Parking the Bus can only work in a two-legged match. I can guarantee you the CL Champion is coming out from Bayern vs Real Madrid match. The CL final score will be for more than three goal difference. Mark my words! It's not a shock win or sport's greatest upset. By no means. Chelsea are a top side in world club football. The Blues have some of the finest strikers, midfielders, defenders and a world class goal keeper. When they sense an opportunity they can attack with purpose. Catenaccio strategy is not alien to Chelsea. There were times when Drogba and Ramires were defending like proven wing backs, supporting Cole, Ivanovic, Bosiwinga, Kalou, Obi, Lampard, Meirelles and Mata in rearguard action. Barça is becoming predictable. They need to add some tall shock imparting strikers upfront. Their awesome ball possession is beautiful to watch. Even with four main players suspended Chelsea has depth and a strong bench strength. Essien, Boswinga, Ferreira, Kalou, Romeu, Malouda, Fernando Torres and Lukaku are capable of doing wonders in the Arena in Munich. Written by an embittered Barcelona fan. This wasn't luck (for Chelsea), and it wasn't even an upset. Chelsea are a great team. The author has overlooked the fact that there have been recent or long-term injuries sustained by Villa, Affelay, Puyol, Pique, Abidal, Alexis, Valdes, Alves, and Iniesta. Anyone seen the news stories about Messi's "gastric issue"? Stuff happens. They will be back. Come on Chealse let`s win this cup for the first time!!! Its interesting how you down play Chelsea's win!!! From the moment Barca was drawn with Chelsea, i knew chelsea was to go throw!! How they were to do it, i didn't know but now i got to know and u did too. As my high school coach told me years ago, what ever happens on the pitch will result to one winner and ll that maters is a win. So If you surprised am sorry but try to look at each game at a 50-50 position. Mind you its Champions League. Remember That. Cudos to chelsea. With Bayern on, lets wait and on the 19th. To all the fans enjoys the games. How can a defeat in the semi-finals of the Champions League be considered a GREATEST upset? Talk about a stupid question. A surprise yes, greatest upset? No way. Although they upset the odds, most true underdog stories come from owing as little to luck and as much to skill as possible in my opinion. Did a similar blog about big upsets in the Champions League if you want to read! The biggest upset? No. The greatest? Very possible. 10 men, no centrals, horrible domestic season, down 2-0 to tie and knock out the greatest team in the world, best player in the world missing a penalty, striker with horrible form scoring the tie. That's what makes this one of the greatest if not the best upset ever. The canonisation of Barcelona needs to end. From the media frenzy you would think they were incapable of losing, yet English teams have eliminated Barca from the Champions League in three of the last five seasons. Some shock. And while I'm ranting, can someone inform CNN journalist Pedro Pinto that his article "Can English clubs catch up with their European rivals" is thunderously amusing, given that it presupposes English inferiority in an era in which eight English teams have reached the Champions League final in the last eight seasons – a run unprecedented in the entire history of the competion since 1955. Can the English catch up? To who??? don't think there is any compelling argument to suggest barcelona get favours from refs. i think it is typical jealousy from inferior sides unable to copy barcelona's clearly unique style. no team has found a way to combat their style with anything other than all out defence. chelsea played to their strengths and got a great result but let's not kid ourselves. in 20-30 years this barcelona team will be remembered as one of the best teams ever to step on a football pitch, chelsea have a long long way to go before that is true of them!! in any case, it's going to be a very interesting final. think bayern will win it though. You put it right !!!! One team is plagued by injuries and illnesses. The other team parks a bus in front of the goal. Zzzzzzz. Tito Villanova, Guardiola has proven himself as a good coach with BARCELONA in 4 years by winning titles. His quitting is an opportunity for you to do more exploits with FCB. Please see every match as final and do your best to make our defense solid. Wishing you the best of luck in 2013 season and beyond! Remain blessed! the greatest upset? pls. chelsea did not win a trophy by this victory. if they did, maybe it wouldve gone up there with the greatest. till then, they should do well to focus on beating bayern munich. if not, it would be a tragedy to come so close and then crash down to earth. A team that plays the same way game after game will eventually be figured out. Morihno came close to this in the elclassico before this last one but couldn't pin it down – how to stop the free flowing passes and penetration. But di motheo nailed it with zonal marking and solid structure, Madrid mirrored this and then Chelsea repeated, but barca played the same and lost the same, it was like watching the same game 3 times over.its good pep left a new approach is needed if success is wanted. The current barca game plan needs to go. Where is the entertainment going if the final of one of the biggest club events on earth is an anti climax? Do you think that it's possible for 10-man Chelsea to beat out-performed Barcelona, should there is no invisible hand playing on the back of the game? Soccer is a biggest manipulating sports ever played on earth. Do you guys still remember score fixing in Serie A? That was a tip of iceberg. Many "weird" results were watched throughout football history. Remember last world cup, where weaker Holland beat Brazil? Or 2008 champion league final, when superior Chelsea was beaten by Manchester United because John Terry missed his penalty. And now Messi missed his penalty too. And the whole saga was nice to watch like we watch opera soap. Mafia and big gambler organization put their hand on every result. So now we can't watch the entertaining football on pitch. Just place your money in your gambling machine and play against all odd. Anything can happen in soccer. You have to give alot of the credit to Di Matteo their coach. He brought them back since villa-boas firing. This is Chelsea's revival. Argentina vs Cameroon 0:1, World cup 1990, Argentina defending champions, Captained bt Maradona against 9 Cameroonians. What would you call that!!!!! i dont understand many people that they have no clue about fottball. Some of you guys are short a bit of gray matter. What luck did Chelsea get? ?...a man sent off and giving a penalty to Messi!! There's is not much luck there. Barcelona were just not good enough. They had 82% possession but only 52% territory....for the slow among you, that means Chelsea basically had the same time in Barca's half as Barca had in Chelsea's. Barca are prolific wasters with the ball and the opposition have realised that you just need to sit back and wait for your chance, cos Barca's defence and GK are absolute crap at actually defending/saving. Barca will lose more and more as teams start to play like this against them. If anything, Barca need to get some balls and actually start attacking the goal and, heavens forbid, actually shoot from outside the box to try and draw defenders out. It was a shock only after 44 min when they were down 2 and 10 men. Before game started, with a 1-0 lead, Chelsea had a decent chance. Upset. My foot.. Next time against barca chelsea will still beat barca! Major upset – Yes. Greatest upset – No. Greece winning the Euro's in 2004 far more of a shock. Uh, no. Of course not. Was it an upset? Sure. But come on. They have unlimited amounts of money and some of the world's greatest stars. Oh they had injuries but so did Barcelona. Think of Greece winning the Euros, or Buster beating Tyson. Those are monumental upsets were the losing team was given about 0 chance of winning. Chelsea was not considered likely to win but among the all-time upsets in ALL sports? That's a joke. It doesn't even rank in the top 50 probably. Greatest upset of all time?! Hahaha! It was very saddening to watch as a Barcelona fan, but Chelsea also is a good team. This upset goes in the record books in 411th place. Karl, I do not agree with you totally but on certain levels. The fact that Chelsea drew on level score at the Nou Camp went against everyone's expectation, mine included. But mind you, I was convinced by some supernatural inclination that Chelsea were going to pull through either on aggregate or something. To me, that was a fundamental advantage. Barsa's greatest mistake was in letting Chelsea have that win at Stamford Bridge. And of course, the ever cocky Barsa players never even imagined that the goal deficit was going to be their downfall. I hope Barsa and any other team out there that thinks itself invincible should have a serious rethink. I suppose Barsa is thinking Chelsea was lucky because of their many missed chances but in football like all other sports almost doesn't count. I hope Chelsea will get its respect henceforth as a team that should be approached with caution. Was that football Chelsea was playing? I thought it was kickball.Too scared to attack , they formed two walls of defenders and kicked the ball away. That's not English football it's Italian catenaccio. This plus Drogba's constantly faking injury let them squeeze through. A disgrace. Bayern should win they are the better team. Football is about utilising the chances in your disposal, any team can play any style that is suitable to the circumstances they were in. So CFC deserved its win, Barca has to go back to the drawing board since Refs are no longer taking sides. Bayern expect fire from CFC since Robie is not ready to be called almost coach. Football is a game like any other game; it's competitive, expect to lose and win....Barca lost to Chelsea which is not actually a big deal if they do accept the problem was with their pride..
Chelsea did not plat against barca. They palyed a dirty football defending with 9 man in both legs. They parked titanic in front of their area. In normal conditions if chelsea played as he plays in premier league they´d loose 8-2 on aggregate. "England were heavy favorites, widely considered to be the best team in the world, whereas the U.S. team was composed of part-time players who had been hastily assembled..."
Where do you place the Olympic semi final win of Nigeria versus Brazil in 1996. Brazil was leading comfortably at 3-1, and the coach was so assured that he removed Ronaldo in order to rest him for the final. They even had a fourth goal disallowed for offside. Suddenly, Nigeria woke up and, with the lask kick of the ball, tied the match at 3-3. Still, all hope was not lost as Brazil regrouped for the extra time. A long cross, destined for Amokachi, bounced off his back instead of being controlled. The loose ball was picked up by Kanu Nwankwo, and there was no apparent danger with two defenders waiting. Amokachi drew one away and Kanu outwitted the other with a body swerve and released an angled shot into the net. By the time the ball was in the net, he removed his shirt and started the celebration. It was the golden goal and so, the match had ended! Messi is the best yes but football is not a one man war, its a team in which the coach is main leader and de Matio is one of the brains in football, only he is not paid as good as many but does it mean he is not better? greatest upset?Champions League final liverpool vs AC Milan, the first one. from 3 – 0 down to winning the game, that is an upset and a half! Chelsea were disciplined, motivated and above all... extremely lucky.. They were NOT the better team! Barca was a better team. So were Real Madrid and Bayern. But did Chelsea deserve to win? Yes they did.. Its football. It is a simple formula. Two fighters, one knows only how to attack but did not know how to defend himself when he is attached. The other one knows that the opponents is stronger than him but he well know how to defend himself and when opportunity presents itself, he can attack. That is what happened. Chelsea knows how to defend very well and knows how to attack and they applied the formula which made them won. For those who have been saying all the crabs against Chelsea, let them remember that Barcelona have never beat Chelsea hands down. 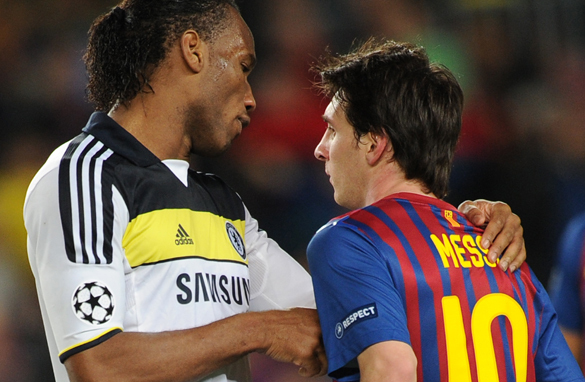 Chelsea is the only club in the world that gave Barcelona hard time whenever they meet. There is no doubt about that one. Alex Thomas , you wrote this article blaming the best sport in the world. Chelsea win seems fixed to you...but when they were struggling with their performance what about that isn't it fixed...3 years back Man city was struggling and Man United were best..this year they are champions coz they invested so much money collecting the best players...why do you think if some team is coming up against these top teams and beating them to the ground then its fixed....I THINK UR ARTICLE IS THE GREATEST UPSET EVER IN FOOTBALL NEWS COVERAGE. I THINK THE BEST TEAM HAS DETERMINATION AND CAN DO ALL BEST THINGS TO WIN, BUT WITHOUT CHEATING. CHELSEA WON RIGHTLY BECAUSE OF SINCERE FOCUS AND SHEAR DETERMINATION. GOOD FOOTBALL. My point is, Barca is best football team in the world but everyone should know that Football match is won by the number of Goals but not number of passes,,,,,. And also in that case we might as well get rid of the Football Posts,and rename the FOOTBALL as a whole , as everyone was having a cry about Barca had so much of the possessions while the result still went in favour of Chelsea. yeh, the two bulls had one thing in common that's winning the game and this real shows that chelsea looked ahead to win and that was all.